Chi Spacca. It's Italian for meat heaven. Ok it actually means cleaver, but the restaurant really is a meat lover's dream. 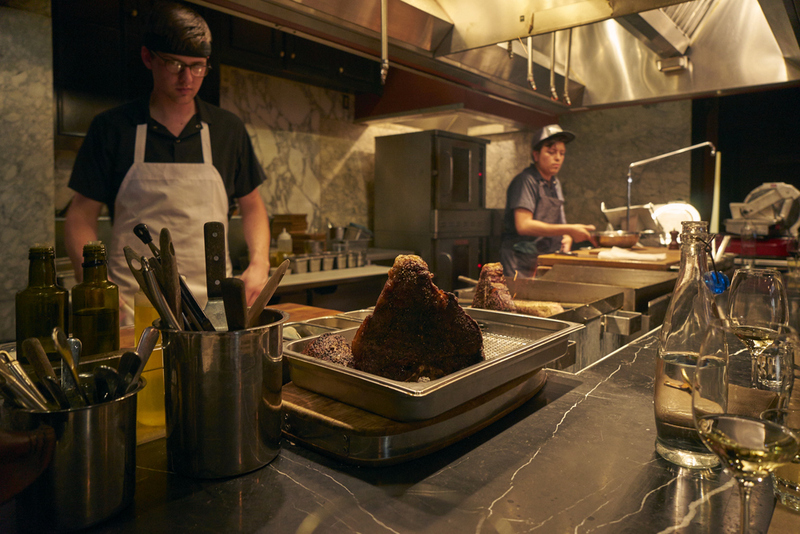 Chi Spacca has been on my list of must visits ever since a few friends went and returned sharing stories of their glorious experience of a meat filled paradise centered around an open kitchen and grill. Great food and my kind of dinner theater? Yea, i'm there. The restaurant is located on the corner of Melrose and Highland inconspicuously right next to Pizzeria Mozza. The only indicator of the establishment is a single sign sporting the image of a cleaver and a menu posted right under it. It's a little strange to find the first time, but I nervously fumbled my way through the front door and made my way to front row seating to join my friends for dinner and a show. We started with the Affettati Misti, a charcuterie special filled with slices of salumi and coppa, pork butter, paté, and trotter fritti. The salumi and coppa are made and cured in house to control the quality of the cuts and were delicious but nothing spectacular. The bricks of paté were creamy and light and a nice little addition to the board. What really blew my mind were the trotter fritti and pork butter. The trotter fritti is basically a crab cake, but with pork. Yeah, exactly. And lastly, pork butter. Spreadable pork bits ground up into a spread you'll want to put on everything. We all need more pork butter in our lives. To help us ease into the onslaught of pork, our server recommended the Insalata Misticanza, an assortment of pickled beats, spring onions, and asparagus topped with rosemary and parsley. The dish is light and tangy and a necessary and very much welcome break from an overdose of preserved pork. Next up was the focaccia, freshly baked on a bronze platter in the wood fire oven directly in front of me. The sound of the crunch while a chef cut the focaccia into slices was simply tantalizing. I started with a knife and fork and ended up with olive oil covered fingers. The focaccia was light and flakey topped with the perfect amount of stracchino cheese and one of the best tasting olive oils i've ever had. I want this everyday. At this point I was full and happy and Chi Spacca had already met my unfairly high expectations. 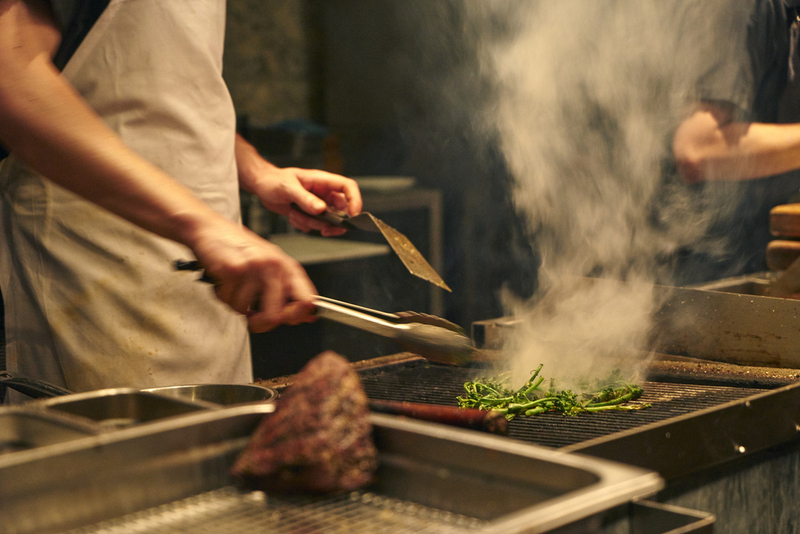 All I could do was hope my body would digest as fast as possible as I watched the chef carefully monitor various cuts of meat slowly cooking on the grill and cutting and plating huge cuts of meat for other customers. Before I knew it, the main event of the night had arrived. A plate of deconstructed tomahawk pork chop gorgeously plated and put on display for our viewing pleasure was placed in front of us. Our server explained that it was recommended to have a slice of pork belly and loin together in each bite. Done. The salt of the rub mixed with the savory of the pork fat exploded in my mouth. Seriously, salt and pork fat together is magical, and the rub and seasoning made for the perfect amount of sultry satisfaction bite after bite. I know i'll be hated for saying this but I do prefer the texture of a sous vide rare plus pork chop, but being able to low and slow grill meat to perfection takes a whole lot of skill and it showed with the perfectly grilled slab of meat in front of us. To finish off the night, we got an order of the bone marrow and meat pie. If this were the end to my last meal on earth, without question i'd be dying a happy man. The pastry is so light, buttery, crisp, and thick that it stands on its own. Inside the pie is filled with tender beef and a savory gravy surrounding a beef bone filled with gooey marrow goodness. Outside of that is the most mouth watering butter filled mashed potatoes that finish off the pie. The pie isn't some hearty man's pie you eat after a day of hard manual labor. The pie is a savory rich man's pastry that makes you feel guilty for putting something so decadent inside you. Just order it and see for yourself. You'll understand. 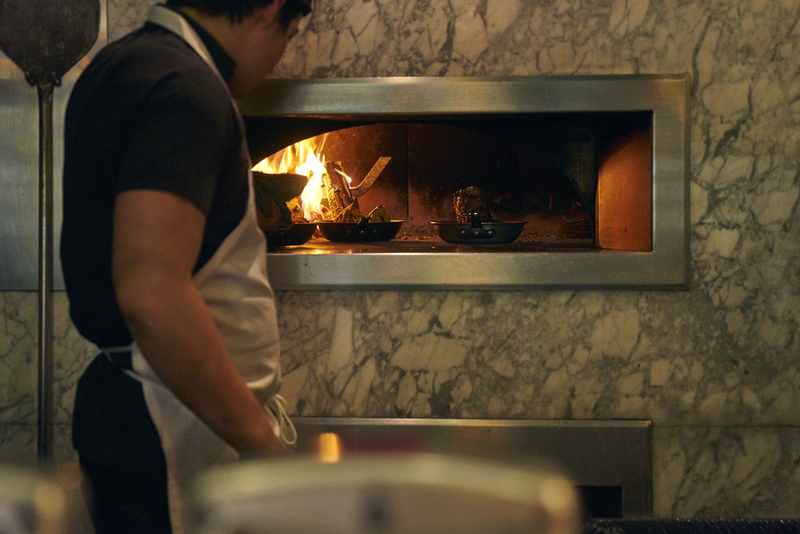 Chi Spacca has ingrained itself on my list of favorite LA restaurants. The staff is warm and welcoming and just made for that much better of a dining experience. There's a bunch of other dishes I want to try the next time i'm back, and hopefully i'm a little bit more mentally and physically prepared when I return. If you're looking for a protein overdose, just look for the cleaver. You don't regret it.